Sigma Thermal designs, engineers, supplies, and services all types of industrial fired heaters and heating systems. A convection style heater offers the benefits of a direct fired heater while eliminating some of the drawbacks associated with radiant heat transfer. Radiant heat transfer can be undesirable in certain temperature sensitive applications as radiant heat transfer tends to be more intense and unevenly distributed around the coil surface. 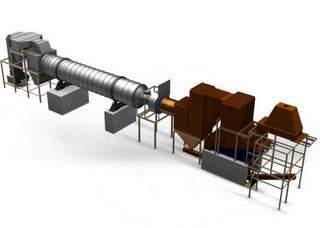 Sigma Thermal’s convection style direct fired heater utilizes a separate combustion chamber and flue gas recirculation to reduce combustion chamber temperatures to 1,400°F, thereby minimizing the impact of radiant heat transfer to the process coil. A radiant–convective style heater is the most well known and commonly used style of direct fired heater. These heaters utilize a bare tube radiant zone in combination with a bare/finned convection section. Vertical cylindrical, A-frame, and cabin style are the most common configurations. Sigma Thermal offers all types of radiant–convective heater designs, including API 560-compliant systems. Direct Fired Design Flexibility Detailed sizing allows for accurate prediction and precise control of heat flux and film temperatures on each individual tube row. Careful radiant zone design and row-by-row convection coil design provide an optimal furnace configuration. Efficiency Base efficiencies can exceed 90% (LHV Basis) depending on process inlet temperature. With an optional economizer, the temperature can exceed 93% (LHV basis). Advanced Control Systems Complete control systems are engineered to optimize system safety and performance. Sigma Thermal can supply simple and cost effective standard panels as well as full process automation and PLC-based combustion control/BMS. Sigma Thermal is a leader in providing modern biomass-fired energy systems and related equipment for industrial clients worldwide. We provide complete package systems including design, engineering, manufacturing, automation, installation supervision, parts, and equipment service, all backed by decades of energy experience. 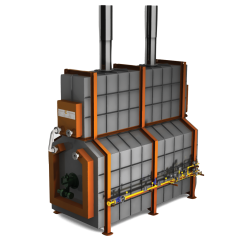 The Sigma Thermal reciprocating grate furnace is the most effective design for complete combustion of waste materials with low heating value, high moisture content, and high ash content. 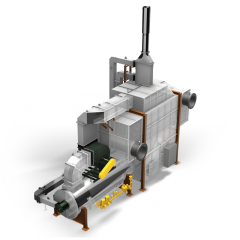 Our design allows for finite combustion control, minimizing emissions and utilizing a large range of different waste fuels with varying characteristics (i.e., chemical composition, fuel size and moisture content).